Curby carts and bags are for disposal of household waste only. Curby carts and bags must be accessible from the street; snow, automobiles and other obstacles must be cleared. Curby carts and bags must be placed street-side by 7 a.m. on your collection day (may be 6 a.m. in some areas). DO NOT load Curby carts over 200 lbs. Bag loose materials like kitty litter, animal waste, sawdust, ashes, insulation and packing peanuts. Place long items (broom handles, curtain rods, etc.) on the ground beside your Curby cart. Close the lid of your Curby cart, if possible. DO NOT leave Curby carts and bags at the curb for longer than 24 hours. DO NOT fill Curby carts and bags with sod, dirt, wood, construction debris, etc. Following these instructions will help ensure your cart is emptied completely and the lid closes after dumping. Carts should be placed within 3 feet of the street. Wheels and handles should be placed away from the street. Cart should have a minimum of 2 feet of clearance on both sides. Please do not place any closer than 2 feet to poles, mailboxes or recycling containers. Cart should be unobstructed (no vehicles parked in front of the cart). Please download the printable PDF below for detailed instructions. 1. Where can I find prices for your services? Due to a number of variables, it's difficult for us to post pricing on our website. However, we'd be happy to give you a price quote over the phone or by email. Please call 1-888-9GRANGER or email info@grangernet.com. 2. Which holidays will affect my service? All Granger offices and operations are closed for these holidays. Curbside collections for the day of a holiday and each day following, during that week, will be delayed by one day. If the holiday falls on a Saturday or Sunday, there are no closings or service delays. 3. How can I dispose of a large item like a couch or television? Fill out the online bulk pick up form. Call our office at 517-372-2800 or 1-888-9GRANGER (1-888-947-2643). Send us an email at info@grangernet.com. 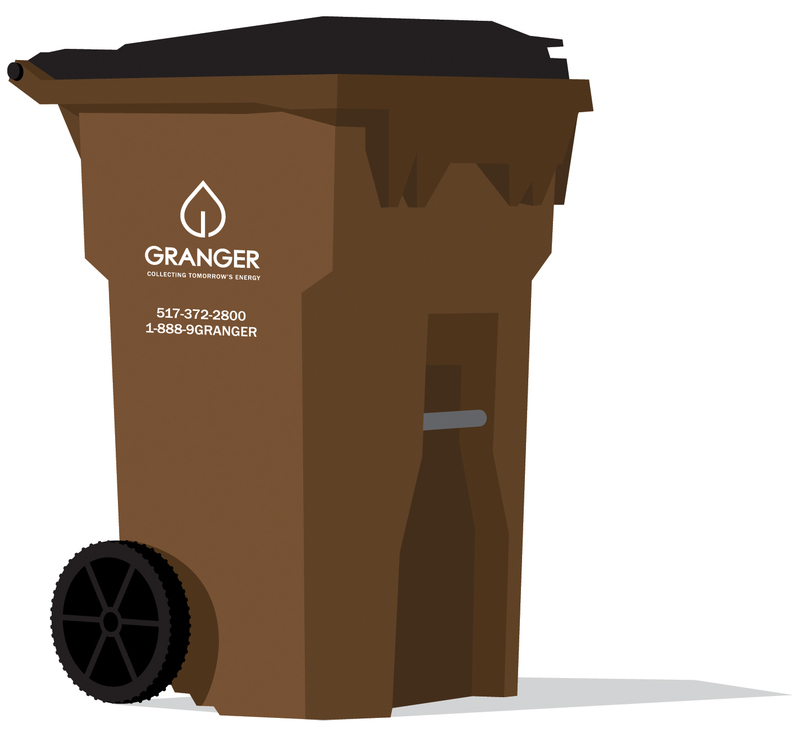 You can also haul the item yourself to one of the Granger Disposal Centers. For locations, hours and pricing, visit our Disposal Center page. 4. Does Granger offer large container rentals? Containers are available in different sizes to meet the needs of your remodeling or cleanup project. Pricing varies depending on container size, your location and the number of days needed. All containers must be prepaid prior to delivery. View our container sizes. 5. Do you offer incentives for referring customers? Yes. If you refer someone who signs up for service, you will receive a free month of service. 6. How do I reserve a pavilion at Granger Meadows Park? After we built Granger Meadows Park, we donated it to DeWitt Charter Township. Please direct all pavilion rental and other inquiries about the park to DeWitt Township at 517-668-0270. 7. How does Granger get involved in the community? We are proud to give back to the communities we serve. Click here to learn more about our educational and corporate giving programs.